Getting married was something I had looked forward to my entire life! As a bride, I wanted all the details to be perfect and seem effortless. As a person who loves to travel, I wanted an extravagant honeymoon too. Ahhh, the honeymoon! Thinking of destinations was as much fun as planning the wedding menu, or what my bridesmaids would where. Italy, New Zealand, South Africa, so many options. Yes, my mind was swirling with possibilities. Then, my soon to be husband snapped me back to reality. " We cannot afford to go to Italy, New Zealand, or Africa, good try though." However, we are lucky enough to live in Hawaii. We live and love in Kona, on the Big Island of Hawaii. Being busy people, we had not been able to explore some of our neighbor islands. So we decided to travel to Kauai for our honeymoon, stopping off there for nine days, on our way back from our mainland wedding. For us, it was a compromise between the adventure my husband wanted, and the romance I desired. We landed in Lihue, Kauai on October 2, 2008 and planned to stay until October 11, 2008. Our first week in Kauai, we stayed at the Kauai Marriot Resort and Beach Club. Since we were traveling on a budget, we utilized the use of our friend's status as sales manager of the Marriott on the Big Island. She got us a great rate, and a great room. The hotel was spectacular. Located in Lahaina, which is considered the more industrial, busy side of Kauai; we were awed by the view of Kalapaki Beach and one of the state's largest resort swimming pools. The resort felt large and luxurious, and nestled in a way, that you never even knew Lahaina was surrounding you. We felt like we never really needed to leave. We really didn't. Spending our mornings sightseeing or gallivanting on beaches, we would return to hours by the pool, enjoying the spacious room to watch some World Series, or sitting on the huge lanais, sipping cocktails and playing chess. 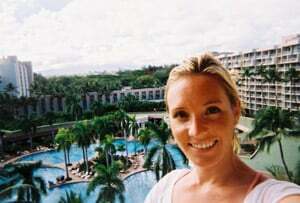 The Kauai Marriott was an absolutely wonderful resort, and we highly recommended it for honeymoons or for any vacation. After staying at the Marriott for a week, we decided to move hotels and locations on the Island to Poipu. We stayed at the Sheraton Kauai Resort in Poipu. The entrance to the resort was simple but nice, with lei greetings by the bellman. The lobby does not mirror the expansive resort, but checking in was pleasant. As we found our room, we could see the resort was right on the famous Poipu beach, known for it's white sand and crystal, teal water. Our room was oceanfront, and we were very happy with the view. The room had a beautiful bathroom, with huge a bathtub and shower. The beds were draped with soft, white canopies making the room romantic and almost nautical. Since the beach was so nice, we didn't mind the shabby upkeep of the small pool. Who needs to go swimming in chlorine when you got Poipu Beach? In Kauai, we certainly were able to do a lot. One of the best activities we did was zip lining. Backroads Kauai, the company we went with, does an amazing job. We rode a huge, old military vehicle through the mountains of Kauai. 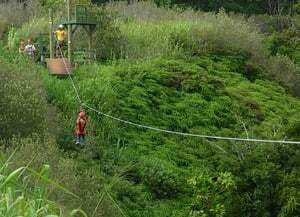 They drop you off with two guides and zip line experts and off you go, swooping through eight ravines and valleys. At the end, the company provides lunch and a dip in the babbling brook. Not only was the rush of adrenaline top notch, the views were spectacular and only there for the eyes of those who dare to go zipping. Another activity in Kauai that should not be missed is hiking. We did two major hikes. The first was along the Napali Coast. The four-mile round trip hike had so many breathtaking views, it was impossible to count them. It was slippery and steep, but so worth it when you end up at a secluded beach. The second hike was through Waimea Canyon. We took the high road and hiked along Hawaii's "grand canyon." Helicopters were level with us, as we viewed over, hearing goats call inside, and watched waterfalls trickle down. Not recommended for those afraid of heights, or red dirt. Lastly, dinner at Tidepools in the Hyatt at Poipu was very memorable. Dining as the sun goes down, ponds surrounded us, feeling like our table was floating on a lily pad. The service, food, and ambiance were impeccable. The dinner at Tidepools was a perfect ending to our affordable, and magical honeymoon. Since we live in Hawaii and got married in California, airfare was part of the cost, but not something we freighted over, since we had to get home to the Islands anyway. Approximately, the total cost of the honeymoon was $2,700. I would most defiantly recommended Kauai to other honeymooners. All the islands are so diverse and offer so much. Being a resident of Hawaii, I was a little less thrilled to be traveling to Kauai for my honeymoon. However, Kauai was one of the best locations I had ever been to. The resorts were phenomenal, the amount of activities is endless, and the sunsets and sands are so beautiful and romantic. Kauai is truly a lover's paradise and great compromise for both the husband and wife's needs when it comes to honeymooning.